Hillcrest View Kilrush Bed and Breakfast in Clare is an attractive family run Bed and Breakfast where there is always tea and coffee on arrival and a big Irish Welcome. A selected 4 star accommodation in a purpose built house, with 6 very spacious en-suite guest bedrooms, fully equipped with T.V, Hairdryer, Tea/Coffee facilities and Alarm Clock and Wifi Internet available. Hilcrest B&B has a Guest Lounge with TV, a Guest Reading Room, Timber Floors throughout and a delightful bright conservatory and breakfast room overlooking our beautiful gardens and patio area. Our Kilrush accommodation is a non smoking house, located in beautiful quiet surrounds, with private car parking for our guests. We also offer our guests a choice of breakfast menus, and we will try to accommodate all tastes and diets. 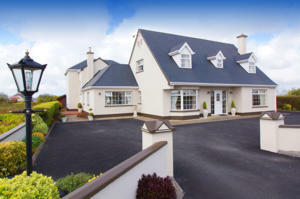 Hillcrest View is situated overlooking the town of Kilrush and the River Shannon in County Clare. We are approved by Board Failte, and Town and Country Homes. We are also Recommended by Lets Go Ireland and Hidden places Ireland. Meaning Church of the promontory or wood, is a busy market town with access to the Shannon.Dolphin watch trips operate daily. The Visitor Center in Kilrush has the “Kilrush in Landlord Times” exhibition. Another interesting attraction is the Scattery Island Visitor Center. Hoping to make your stay a memorable one.